We urge you to bring forward legislation in Iran to end the use of wild animals in circuses, a measure supported by a growing number of regions in Iran who no longer allow circuses with such acts to perform. Shahram Ahmadi, Director of Environment in Chahar Mahal and Bakhtiari, one of the first provinces in Iran to ban the use of wild animals in circuses, has stated that “using wild animals in circus is clearly an act of animal abuse and we strongly condemn such wrong, cruel acts.” Thirty countries around the world have already implemented animal circus bans nationwide, indicating how attitudes are changing and there is a global move away from allowing wild animals to perform in circuses. The evidence supporting a ban on the use of wild animals in circuses is overwhelming. Circuses simply cannot replicate the physical and psychological needs of wild animals, or create a suitable environment where the natural behavioural repertoires of the animals can be satisfied whilst on tour. The welfare of animals is inevitably compromised by the constant travel, with most of the year spent in temporary, collapsible accommodation. Wild animals can be powerful and dangerous and the day to day husbandry and tricks they are forced to perform require close control and subjugation. Numerous undercover investigations conducted worldwide have documented the widespread use of brutal training methods and casual violence. No other part of the entertainment industry is so routinely associated with violence towards animals. There is no place in a civilised society for the abuse of animals or their manipulation for the purposes of ‘entertainment’. We hope that we can count on your support and that this outdated practice can quickly be banned in Iran. On behalf of the animals who, without legislative action, continue to suffer, thank you. Stop the cruelty !! Wild animals are born to be free !! Using wild animals in circus is clearly an act of animal abuse and I strongly condemn such wrong, cruel acts! This is no way for an animal to live. Please stop this barbaric practice, and let the animals go to a sanctuary to live out the rest of their lives with room to roam. Circuses are good only for entertainment and harmful in any other way. Circuses need to be stopped completely every where all over the world. No more animals in circuses. please lett this STOP !!!!! Please stop this barbaric act, Iran is better the this. Stop this 18 century barbaric act now and set these pure animals free! No more wild animals in circuses, please. Cruelty is not entertaining. Please stop this animal holocaust!!!!! We do not need animals to suffer for our entertainment.We need them to live peacefully in the wild.Let people do tricks if circuses feel this is necessary,but leave the animals alone! Wild animals do not belong in the circus and when there spend their whole life suffering! Please have a heart for these animals and behave like a civilized country! Please put an end to this kind of exploitation. STOP circuses with animals especially the wild animals. They do NOT belong there! They are suffering and it is no way to learn children to know them. Set them free and take the children to the wild and learn to know them there…..
CIRCUS’ NEED TO BE BANNED EVERYWHERE. ANIMALS SHOULD NEVER NEVER BE USED FOR ENTERTAINING. STOP ANIMAL CRUELTY ONCE AND FOR ALL!!! Stop circuses with animals especially the wild animals! 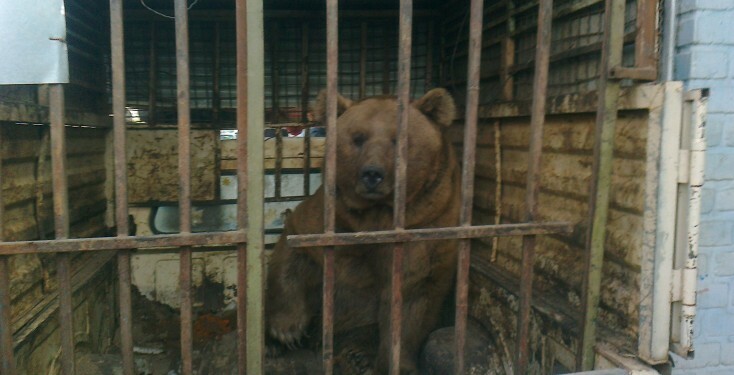 Stop this dreadful suffering…Stop bears being circus acts. Lugar de animais é em seu habitat natural. Пуснете този невинен затворник, гадове! Stop using animals in the circus. It is a cruel and barbaric act!!! stop use wild animal in circuses !! Chega de crimes contra animais! Sou contra kalker forma de uso com animais ke cause dor ou sofrimento, LIBERTAÇAO ANIMAL JA!!! Stop using animals in circus ; they have no place behind a cage !!! Put them back in the wild, that is where they belong. I am against wild animals in circuses. Na Nova Era não se aceita mais isso!! boycott the circus horrors and let the animals free as god intended thanks. please stop animal abusement !!!! I cried when I see this! No animal should be abused or forced to perform for humans. They lead a life of suffering and deserve love and respect. No more animal cruelty please!!! High time to say “no” to circuses with wild animals. I’m an Iranian. Animal mistreatment and cruelty must be stopped and punished no matter where. Please do your best everyone, Iranian or non-Iranian to make governments establish strict rules to protect animals and punish those who committed the acts. Any sane person is suffering along with these animals every time something like this happens. Sane people, animal lovers, humane individuals, UNITE to make it happen and end the misery of many potential animal victims.